I’m finally going to attempt to post about the success of using “magic tricks” to teach (mainly) solving linear equations in one variable. Disclaimer: most of you might not know that I’m not the best with the English language and I am so much better at describing stuff like this by showing/doing so I know that I won’t be able to get across to you my full intentions but at least you can get a better idea and maybe experience as much success as I have with magic tricks. To start off, this wasn’t my original idea. I learned of magic tricks after downloading and glancing through Dan Meyer’s Algebra curriculum. I took his idea and modified it to meet my student’s needs. So essentially my students last year, helped me design our “table”. In addition, in this post I am attempting to explain reasoning for important pieces of the lesson that is crucial for student’s success. I apologize for its lengthiness. We start with me trying to “perform a magic trick” on my students. Some of them realize what I am doing instantly and once I get them hooked with this I have them start creating their own magic tricks (using whiteboards) and perform tricks to their partner. They are just mentally practicing to guess their partner’s number but they are also required to write down some math work to show me the thinking that happened in their head. This leads us towards an exit card or homework where students have to perform a trick to someone at home (great parent involvement) and guess their number. 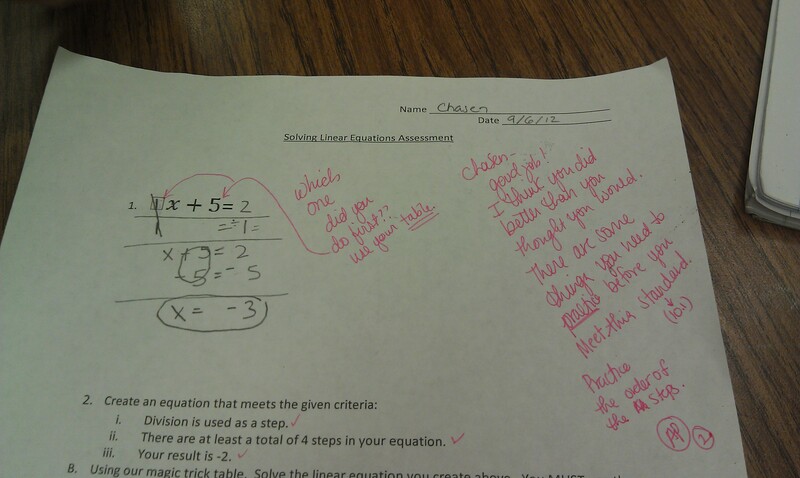 Students are also required to have their math work to show their thinking (basically mirroring our classwork). We now move from only the steps of the magic trick and the math work (sometimes called “In My Head”, “Magician’s Work”) to “How do we write these steps using math symbols?” I’ve also used lies like “I want to do this magic trick to a friend who is in another country, is there some type of universal language I could use to describe the trick to my friend?” Another route: I am very adamant about kids “becoming mathematicians” in my class so I’ve asked them “On our journey to become mathematicians how can we write these magic trick steps? That is where the 3rd part of the table comes in “Math Notation” (we also break down the definition for notation). Most of them want to write the number THEY picked in this first step but then I start asking a bunch of kids their numbers and say “how do I write all of your numbers?” another route: switch gears and ask them to be the magician now and express the number someone picked, which you don’t know, as a number. At this point most students will know variable. Now we get into translating verbal mathematics into math notation. Great discussions have come from this part of magic tricks: regarding 2*a or a*2, the need for the multiplication symbol, which notation is “right”? Which ones do we use and why? Which ones do you as the teacher prefer? etc. We also discuss differences between (I create a whole day lesson around this one) 2a+3 and 2(a+3) why the need for the parentheses? Does it produce different results? Order or operations, etc. we discuss the last step of the “result is” what does that mean in math? Also what does the equal sign mean? 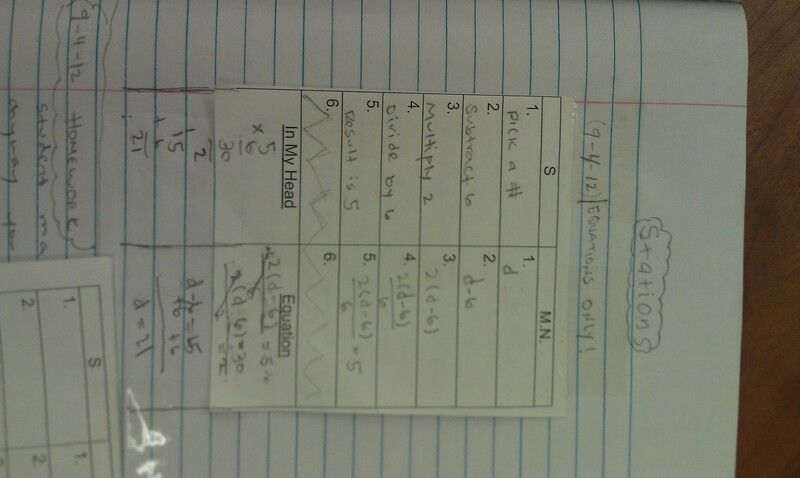 You can guess that the homework/exit card that might come from this is the independent practice of math notation. I like to have them use the SAME magic trick as previous homework (gives a need for homework to be done and connection between homework and classroom). After the success of these 3 parts we move to the real reason for this magic trick…..THE LINEAR EQUATION!! Now you might not have noticed how we setup the table here but you will now because this 4th part will go right underneath math notation. Reason for this is because there is a connection between the math notation and the linear equation and putting the equation right underneath tries to keep that connection visible for students. Soooo, where do we start? OK….what do we do next? Why isn’t the step different? Do we get different answers between the two methods (in my head & equation)? Why not? How do you know? Now I must mention here that this part gets a little tricky because teachers differ in words they use and notation they use to display the zero or one that is made. I am very picky about my words and my notation. I want them to see that it is ZERO or ONE and that it doesn’t just “cancel”. Why? because that is the truth of what we are doing….we are using the inverse properties of addition and multiplication and we really need to be specific to show them here. In addition, since we are doing the opposite steps of the original magic tricks steps it is important to discuss the inverse here and to show students this connection. 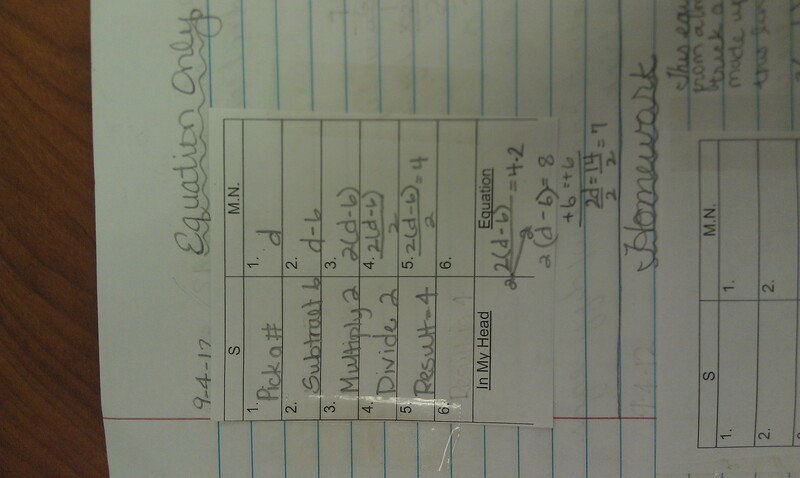 As you can see I have students draw their zero and their one when they solve their equations. Another thing you may notice is how I have students write the equal sign between numbers to make a true statement. I don’t FORCE them to do it but I highly encourage them to do so…it is another one of those meticulous math things I have them do so they can justify each step they are performing. Many students get caught up on this and when I ask them about their “true statements” it instantly helps them see their mistake. When it comes to homework on this lesson, I normally just have students do ONE step in the equation part of the table but are asked to finish the rest of the table. Reason for this is so that kids don’t get too frustrated and immediately get turned off…..remember I said time and patience is key here. It is important for students to feel successful for this to work. But some students ask if they can do the whole thing and I tell them why not but my min is ONE step. Basically that is the ending of the setup for the magic tricks. The rest proceeds with practice in class, independent practice, going through notation specifics, discussion of variations we encounter, etc. Lastly, I have some things that I want to mention that I have experienced in the past few years of using this to teach this concept. Differentiation: Depending on what students can handle you are able to give students more (or less) magic trick steps to accommodate their capabilities. I have used operation and number dice to have students create magic trick steps in order to challenge their skills. I have also been able to modify tricks so that students who need to work with only whole numbers can and those who are ready for fractions are able to use them. Other Ideas: I have thought about creating a couple more stations for practice but never got it done this year but would love to start it someday….matching station where they match equation to steps (this is to get students to start using ONLY the equation), cutting up parts of tables and have them match the 4 different parts to each other (i.e. steps, math notation, equation, in my head all need to match), same concept as matching up the parts but put into a game like memory where they flip four cards instead of two. Equations only: Now many teachers are thinking well how do we get them to just use the equation and not the entire table? I have conversations with kids to try to do this but some of them just NEED that table. If that is the case then I don’t push them to NOT use it…Why? because there is nothing wrong with using the table to help you…yes it takes longer but the standard doesn’t say they have to solve a linear equation in x mins. In my mind, whatever it takes to make students successful is my goal and if this is what they need then so be it. I will continually push students to NOT use the table but again if they need it then they need it….Also, part of the table (steps –> math notation) is a benchmark that I am assessing so I make them use the table on a couple of problems to show me their level of mastery for that benchmark. More Connections: The connection between the In My Head and the Equation is very crucial and I don’t discuss it much above. 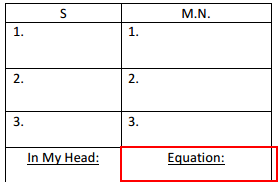 It is important for students to use the In My Head portion of the table to CHECK their answers. This is why it is important for them to be able to mentally be able to guess someone’s number because that is the part that they will be using to check their equations. They should see that there is NOT much difference between the two methods. We have discussions about this: What are similarities and differences? Why do I (Ms. Sadie) make them do both? What should they be using it for? How can you use In My Head part to tell if you did the equation part right? I know I missed some of the connections I help students make so I am will probably be updating this post throughout the rest of the year with things that pop into my brain randomly!